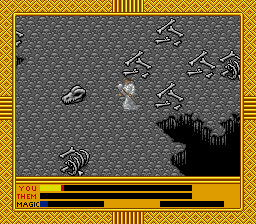 Spellcraft was an unreleased SNES game by ASCII. 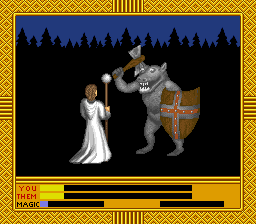 A ROM image of the of the game exists. 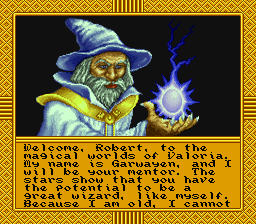 Spellcraft is based on the PC game of the same name. There is a beta of the game floating around on the internet, and seems rather complete. It is compatible with the SNES mouse, although it seems rather clunky (for instance, you must click both buttons to get to the menu). The gamepad is a better choice. I didn't delve too far into the game (the battles lacked distinct strategy, making them hard to win). Hopefully at some point I will have time to explore it futher. 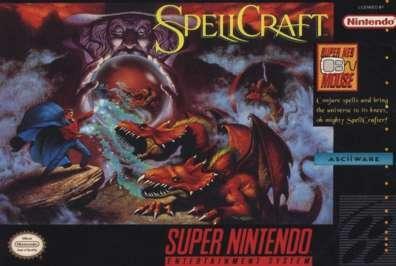 SpellCraft SNES Version 01.10a Copyright 1993 ASCII Entertainment Software, Inc. Written by Scott Nelson and Jeff Davies. The game was developed by Ybarra Productions. This game was first announced at the January 1992 CES. Nintendo Power mentioned in their May 1993 issue that they expected the game to be released in the fall of 1993. The main base is very detailed, but little to do here at the start except get a password. 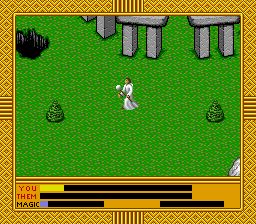 The overworld is green and bland. Good luck in these battles at the start. You are weak and likely to be crushed. If you die, you end up in this evil realm. 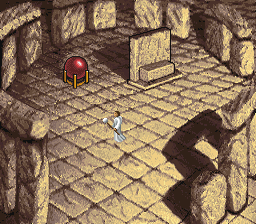 The ROM image was originally leaked by the BBS scene group Magical. If the date stamps on the files are correct, it was leaked in late August 1993. The game was burned on a EPROM that originally hosted Smash TV, and all the header info is from that game. The Spellcraft ROM image that is floating around the internet now actually has a hacked internal header. I've included the original leaked ROM image (sans copier header) below. Note, the scene group added an intro on this.